The bathroom is a place of necessity. Its purpose is wholly functional. We need the bathroom to perform for us as a place in which to clean ourselves, maybe shave or apply make up. Most of all we require that our bathroom be always on stand-by. More than any other room in the house, the bathroom is multi-functional, serving our essential needs as well as our requirements for luxury. It is also one of the areas in a home that guests are very likely to see. A piece of furniture that is considered essential for a bathroom is a vanity unit. Dependent on the style, size and colour it can be the focal point of your bathroom. And most importantly, it is the part of the bathroom that lends itself most to a decorator's touch. As storage is something important to think about in terms of a bathroom, a great timber bathroom vanity can also provide you with storage space that is easy to access. As well as storage, your timber bathroom vanity unit will set the tone for colour choices and style of your bathroom. When buying a timber bathroom vanity, there are a few important factors to consider. One of them is the size of the cabinet. 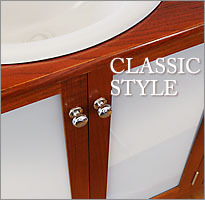 Ideally, your chosen timber bathroom vanity has to be the perfect fit for your bathroom. It shouldn't impose on the space that you wish to create. Just think spaciousness with style. Colonial Living offers a great range of timber bathroom vanities, from the traditional and colonial to the contemporary in varying styles and sizes. Living to our tradition, our chosen timber is primarily red cedar. And we always pride ourselves on manufacturing our bathroom vanities with your custom sizes in mind. For your choice, we are proud to present three different timber bathroom vanity styles in solid red cedar meeting your bathroom d?cor requirements. 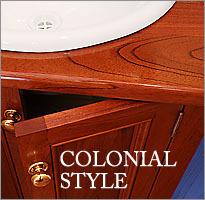 Our colonial style bathroom vanity range offers a distinctive look for the discerning eye. If you go for a colonial style of bathroom vanity, it will be a piece of furniture to be proud of, rather than just a fixture. As our customers are accustomed to, our timber bathroom vanities are usually masterpieces of style, craftsmanship and durability. 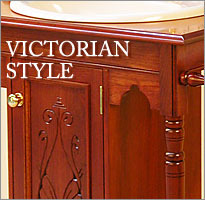 Extravagantly 19th century, our Victorian washstands are a handsome advantage to small bathrooms. The sophistication of the traditional design is evident for your scrutiny and the quality of craftsmanship respond to your touch. The translucent white panels or milk glass on our classic style timber bathroom vanities convey a soft and diffused glow. Incredibly contrasting beautiful red cedar on grey or white snow. Colonial Living's bathroom essentials & accessories cater for the traditional and contemporary of bathrooms. These bathroom fixtures and accessories are designed to look their best in your bathroom setting.